Many weeks have passed since my last Untappd wrap up. Like with the Hottest 100 post - work, uni, I.T. issues and holidays have got in the way of this... Accordingly it's bigger than usual - hopefully it's still just 15 badges when I've finished writing this post! One of the beers I look forward to every year is the Duvel Tripel Hop. Normally Duvel is brewed with just two hops, Saaz & Styrian Golding. Once a year they brew this beer using a third hop; this year the experimental variety HBC 291, which has now been named Loral. This hop provided a wonderful lime and pepper flavour, which suited Duvel brilliantly! Belgian Holiday (Level 28) was the badge. The ever confounding New Brew Thursday badge, (Level 20), was unlocked by Uinta's Dubhe Imperial Black IPA. It was a lovely Black IPA, clocking in at 9.2%, packing a bitter punch - which is listed at 109 IBU's. There's also this very interesting licorice flavour that compliments the roasty flavours you would expect from the style. Despite not being the freshest offering; I was very impressed with this beer. Beers that unlock 2 badges are pretty rare for me these days. Funk Estate's Gose Town did just that; unlocking Pucker Up (Level 37) & What Gose Round (Level 3). For those missing the reference; Gose is a sour style of beer, originating from Goslar in Germany. I got my hands on this through Tru Bru - it's their GABS beer from this year and, as far as I know, it's keg only. It's a good example of the style; with a sour sweet base, plenty of coriander (avoid if you're not a fan) and light saltiness on the back of the palate. If you are unsure of what Gose's are, this would be a good starting point. A couple of weeks ago Dylan and I shared a number of beer whilst watching the footy. As usual, we dotted several lighter sours throughout the night to cleanse our palates; which has the fringe benefit of making sure we can both get stuff done the next day! Swedish brewer Dugges provided three of those sours; with their Black Currant the only one to earn a badge. It was my least favourite of the 3; I thought the lacto was a bit too strong and the black currant was subsequently detracted from. It was a perfectly acceptable beer, but was overshadowed by Bow Tie Daddy (an aggressively tart Berliner Weiss) & Tropic Thunder (reminiscent of sour breakfast juice - spectacular). Swedish Brews (Level 2) was the badge. Bad Shepherd's new one; New World IPA, is absolutely on point! This is one of the best Australian made examples of a straight up and down American IPA. Hopped Up (Level 42) is richly deserved for this beer, clocking in at 74 IBU's, utilizing Australian, American, New Zealand and even French hops. It's a wonderfully bitter beer and also smacks you in the face with pine resin and tropical fruit flavours. I loved this beer and can't wait to go back and grab a 6-pack! I do find it interesting that Scottish beers count towards both God Save the Queen & The Highlander badges... Obviously I understand why, but it is interesting nonetheless. The beer that spawned that little muse was Harviestoun's American IPA, which unlocked God Save the Queen (Level 33). It's not a beer I distinctly remember; other than thinking it was very bog-standard for the style. My notes don't help much either - other than to confirm it was a passable, if forgettable, IPA. Almanac's Elephant Heart de Brettaville was anything but forgettable! This was plain and simply one of the best beers I've had this year! The combination of the Elephant Heart (a type of Plum) flavour and the Brett was just superb! Pucker Up (Level 38) is why we're talking about it, although at another time this would've been reviewed in full! I'm doing a big Almanac tasting with Richo in the next month or two - which I will post a full wrap up of - so keep your eyes peeled Almanac fans! I was really impressed with the beers from Kees, a Dutch brewery, that made it out here at the end of last year. There's recently been a second, more winter-friendly, influx of their beer's including the 1750 Export Porter. It was a really big Porter, clocking in at 10.5%, and was packed full of roast, some dark fruits and even some licorice. The only thing that detracted from it for me was a strong yeasty (almost Vegemite-like taste) that you were left with at the conclusion of each mouthful; I'm a big Vegemite fan, but even I found it too much. Possibly it was a bottle gone bad? Heavyweight (Level 45) was the badge. I've finally unlocked the Beach Bum badge! It took a surprisingly long time as I'm quite partial to on beach drinking - although clearly I revisit the same beaches over and over again. Whilst on holidays; a very fresh Pilsner Urquell from the Dan's in Cairns was enjoyed on Thornton Beach, near Cape Tribulation. This offering was one of the best Pilsner Urquell's I've had outside the Czech Republic. It had that wonderful Noble Hop character that this beer is so renowned for. It's a wonderful beer when fresh - and if there's fresh stock in FNQ there has to be some near where you live! On holidays the varied check-in locations always lead to a number of the location badges being unlocked. By the Campfire (Level 7) was unlocked at Cape Kimberley, one of few spots north of the Daintree River with phone reception. Lizzie and I made the journey down most nights to watch the Tour de France on the iPad, send some emails and (naturally) enjoy a few beers. On this occassion the beer was the Pirate Life IPA - a beer I muled several of up to FNQ. It's a spectacular example of an Australian brewed American IPA, with chewy caramel malts offsetting the hops which have a strong pineapple element accompanying the usual tropical fruit and pine flavours - as well as nice pronounced bitterness. Port Douglas have recently got their own brewery; Hemingway's. Naturally while I was up there I thought I ought to pop in and check it out. The venue is awesome and situated in a particularly picturesque spot - if I have time I'll pop out a full review of the place in the coming days. As part of my paddle I had a Bicycle Beer from Temple Brewing in Melbourne, at this stage they don't have enough beers of their own to complete a full paddle. It tasted exactly as I knew it would; lightly wheaty, very effervescent, spicy hops and nicely refreshing. Blondes Do it Better (Level 5) is why you're hearing about it! It's always a treat to try a new Mikkeller creation. Wit Fit is, strangely enough, a Witbier that unlocked Danish Delight (Level 5) - the badge for trying different Danish beers. It had all the elements you'd expect from a Witbier; light wheat flavours, coriander and some yeastiness. However, it was by no means a traditional Witbier with a bucketload of hops being added; imparting bitterness as well as citrus and fruity characteristics. It is also listed by Mikkeller as an "Imperial Witbier", which certainly was not evident throughout drinking! Another trip to Hemingway's later in my holiday yielded another badge; Hopped Up (Level 43). Once again it was a guest beer, Yulli's Brew Louis Black IPA, that took home the prize. This was quite an interesting Black IPA, that changed dramatically as it warmed up. At first I thought it was disappointing; a little thin and lacking in either roast or hop characteristics. As it warmed the roast became more pronounced, although still a little underwhelming for the style, and the hops provided a nice bitter bite. It's not a beer I'd be rushing back to - but iI certainly wouldn't turn down another. 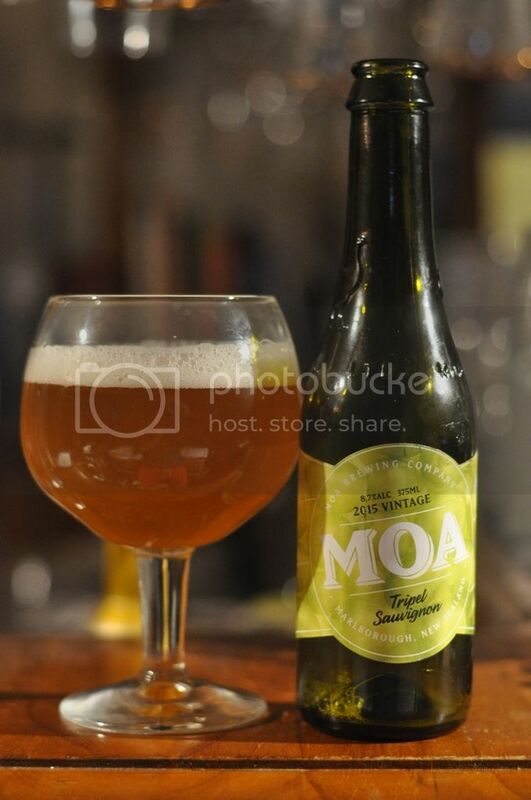 Last but not least, Moa's 2015 Tripel Sauvignon unlocked Dubbel, Tripel and Quad Oh My! (Level 5). It's a really interesting beer. The Candi Sugar that is usually so important in a traditional has been replaced by Sauvignon Blanc grape juice - clearly it worked well! I didn't know that before trying the beer; and actually thought the vinous characteristics were relatively mild, and were even slightly swamped by a traditional Tripel sweetness. Certainly there was some fruitiness that you wouldn't find in a regular Tripel, but I thought that it was close enough to a traditional example with just a tiny twist. I would definitely recommend picking one of these up if you still see one sitting on a shelf. Finally I've finished this monster post! I hope you enjoyed reading this post as much as I enjoyed drinking the beers. Let me know your thoughts on any of the above. Also check out this post by Kerry McBride of the Crafty Pint that I was fortunate enough to be interviewed for. Part 1 here & part 2 here. It's a really cool piece exploring the impact that social media, particularly Untappd, has had on the beer world. Until next time guys!